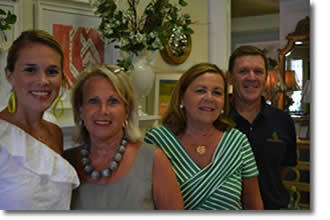 Colonial Designs was founded by Ann and Maurice Brotzge on March 23, 1951 as a full service florist. The first location was on West Broadway where the shop was in the front and their home was in the back. In 1963, Colonial moved to its present location at 3712 Lexington Road. Over the years the shop has expanded and developed in size and inventory. Three of their five children are now running the shop, Martha Weinert, Terry Dayton, and Joe Brotzge. A granddaughter, Amy Moyer is also a valuable part of this tightknit family business. Colonial now carries a full line home interior items such as upholstered and wood furniture, lamps, pictures, and mirrors. They also carry a fashion clothing line, jewelry, handbags, and many unique gifts. Along with fresh flowers, silk and dried floral arrangements are also available. Give us a call at (502) 896-4461 to learn more about what products and services we can provide for you!